If you have flat feet, you’re in good company! Flat feet syndrome is the most common type of foot ailment in the U.S. studies have shown that nearly 25% of the population has flat feet. Flat feet syndrome basically means that you have a collapsed or very low arch. That makes a huge difference in your walk since the arch of your foot is usually responsible for absorbing the stress of impact with each step. Flat feet cause stress to spread to the heel and toes, and often result in pronation, or tilted/uneven feet. The easiest solution is to wear supportive footwear, like sneakers or corrective walking shoes. There are tons of different kinds of options on the market, and it’s hard to know where to start looking. That’s where we come in! We’ve done the research and come up with a list of the top choices for the best walking and running shoes for flat feet. These are from some of the top brands in footwear, and span a range of comfort and cushioning levels. Keep reading to find the right pair for you! The Brooks Adrenaline is a low-profile runner which is designed to alleviate arch pain and stress for flat feet. We love its durable outsole and breathable lining materials. This is a perfect choice for people who need something with minimal arch support and a natural road feel. The Adrenaline has a good balance of motion guidance and cushioning, without feeling constrictive. Plus, these look much nicer than other specialty shoes! This latest version is the best yet, and we can’t recommend them highly enough. This edition is brand new! We were massive fans of the Adrenaline 16’s last year, and older models of this shoe are still extremely popular now. They had phenomenal forefoot flexibility and some key reinforcements in the outsole which made them more durable than previous generations. We still recommend the 16’s, if you need a cheaper option. The 17’s keep all those improvements, adding special anatomical design elements which help make both the men’s and women’s versions more appropriate for each body type. They also cut weight even further, and these are the first Adrenaline’s to weigh in under 9 oz! That’s very light for something with this much support. The outsole is designed to be especially durable. It’s reinforced in key contact areas which usually break down quickly. And with pronation correction, you won’t wear down the back corners as quickly. If you’re planning to wear them a ton, these are a good choice for you. The cushioned sole is aligned to give you full-ground contact with each step. This makes for better transitions and push-off. There are also grooves throughout the sole and forefoot for improved flexibility. It’s designed to give you an accurate road sensation but soften the blow slightly. The low-riding sole makes these a good choice for walking with flat feet because you won’t be wobbling on tons of cushioning you don’t need. The upper uses breathable mesh linings for moisture and heat control. The material is also odor-resistant. In short, a comfortable ride for long runs! The arch support is reclined to suit flatter feet while giving your arch some basic structure to work with. That’s important for some people. Common philosophy has it that flat-footed runners need extra arch support. However, some people run into problems with high-pressure points on their arches, and endless blisters. If that’s happened to you, you’ll know why the low-profile arch in these shoes is such a lifesaver! Previous buyers were very pleased with the overall ride. They said that they’d been directed to this pair by their podiatrist of running store expert. After running on these for a while, they said that blisters and aches were history! They’re not as heavily cushioned as some reviewers expected. The emphasis is on stability rather than support. We’d classify these as “lightly” cushioned, although you could certainly swap out the insole for something more supportive. If your podiatrist has recommended something with higher arch support to compensate for your flatter feet, you’ll want something with a bit more of a build in the arch. The Adrenaline is really designed to complement and alleviate arch pain with flat feet, rather than correct them. 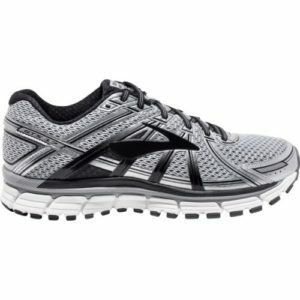 Check current prices for the Men’s Brooks Adrenaline GTS 17! These are a more structured model than the Brooks, with a clearly defined arch and a reinforced foot-bed. They’re better for people with some pronation, who want a shoe that can keep feet running smoothly without adding weight or bulk. If you’ve tried something minimal and found it wasn’t structured enough, these are the next step up! We particularly like the special Lunar foam, which is amazingly light and airy. The Lunar Glide’s strike a great balance of support and cushioning while feeling just as light as your average pair of runners. They’re a great shoe for people who don’t link clunk! The Lunar Glides provide a bit more structure than the Brooks. They have a more defined arch and a stronger foot box. Runners said these were extremely comfortable and helped them run further without stress. Many said that the structured insole added more of an arch to their feet, without feeling stiff or intrusive. If you need a more prominent arch mound, this one’s a better choice than the Adrenaline 17. Nike’s two-part midsole foam gives you that stability without adding clunky weight. A harder foam on the medial side keeps the structure of the arch, keeping your foot from pronating. Lunar lightweight foam throughout the shoe provides a cushion while you land. And because it’s lighter and airier, it’s more responsive and flexible than stability shoes. Prefer a lightweight, supportive option? This pair is for you! There’s also a support platform at the heel instead of a medial post. We love it because it provides stability without the stiff ride normally associated with stability shoes. Reviewers said that the overall feel is supportive but still responsive. The mesh upper is specially designed to maximize airflow inside. This helps keep heat and odor at bay. It’s supported by a foam-based cage, helping your foot stay stable. The foam and mesh combine to give a sock-like fit along the whole foot, which we love for running! These are primarily aimed at runners, but they also make superb cross-training or general workout shoes. The sizing seems a bit particular. Some reviewers found that these ran small, while others found them too large for a secure fit. We’d recommend making sure you’re clear to make free exchanges, in case you need to make a switch. As with all of the latest Nike styles, they’re quite pricey. Check current prices for the Nike Men’s Lunarglide 9! For the people who need the most structure and motion correction, we recommend the Adidas Supernova. It’s more solid and supportive than the other Brooks or Nike and has a stable frame that’ll keep you running straight mile after mile. Best of all, it’s a bouncier, less-clunky option than other stability models. This is our recommendation to folks who want a structured pair of kicks to cut out their wobbles. The sole contains a stable EVA frame and uses a mid-sole support system to help your feet maintain their alignment. In addition to arch support, the mid-foot section wraps around your foot to keep everything aligned as you follow through each step. The sturdier, more structured base makes these the best choice for people with more pronation, who need a bit more motion control. Reviewers said they were very durable. Several wrote that they’d been running on their Supernova’s for as long as 2+ years! Adidas’ cushioned BOOST midsole is designed to provide forward momentum and help you maximize your speed and thrust. It’s made of special foam which essentially bounces back from the impact, adding a spring to every step. It has the give of the Lunar foam, but with more kickback. Fan of bouncy sneakers? Choose these! The extra spring helps to balance out the structured sole design. Previous buyers said the padding made these a great shoe for longer runs and races. Many also found that knee pain wasn’t a problem on longer jaunts once they’d switched to the Supernova’s. The latest versions have continental rubber on the outsoles for phenomenal grip on all pavement and indoor surfaces, even in wet conditions. There are a lot of synthetic traction compounds used on running footwear today, but sometimes it’s better to go old-school! They’re a bit heavy for running shoes. This is typical of stability models, but some reviewers did say the weight of these took some getting used to. While they provide bounce, the density of the support cushioning adds some bulk, particularly in the heel. Most buyers said they adjusted to the extra weight in a week or so. In any case, they’re lighter than comparable Asics styles. These run about a half-size large, so bear that in mind when you buy! 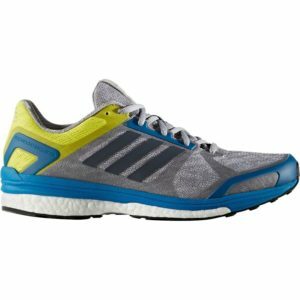 Check current prices for the Adidas Performance Supernova Sequence 9 Running Shoe! The Adidas Energy Boost 3’s are a super choice for people who want a shoe that can restore some of that natural bounce that’s missing from a collapsed or lowered arch. They’re very springy, with some structure through the midsole to keep you wobble-free at the same time. We like them because they’re responsive without feeling the least bit precarious. A great choice for walking or running! The midsole foam includes Adidas Boost material, which is designed to increase forward momentum and return the energy you put in. It gives you a nice cushioned base, without making the landing feel squishy and sluggish. Reviewers said the overall feel of them was cushioned, with a particularly comfortable forefoot “strike” zone. They also appreciated the Boost spring effect, which really makes longer runs feel less tiring. They’re very well-constructed. The outsole is designed to be resilient in traditionally weak areas. The upper combines a padded sock-liner with breathable mesh. It’s designed to fit snugly on your foot, preventing slippage and ensuring constant support. The 3rd editions add an improved sock liner that’s even more adaptive than the 2nd. There’s a supportive midsole which combines foam with a strong torsion bar. This controls excess movement and contributes to proper alignment. And it’s always lined up with your feet, thanks to the sock-like fit! We love that the support material manages to be both strong and flexible at the same time. They run small. Reviewers said to buy at least a size and a half up. They’re responsive and springy, but they’re not as cushy as an Asics shoe or other deeper options. We prefer a lower-rider like these for flat feet, because they keep the center of gravity nice and stable. However, if you’re after something with a more pillowy feel, you may want to look at one of our other recommendations. 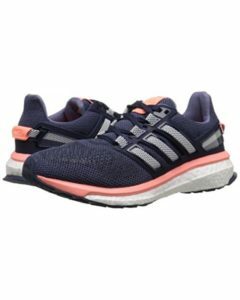 Check current prices for the Adidas Women’s Energy Boost 3! These cushy walkers are designed for maximum comfort. 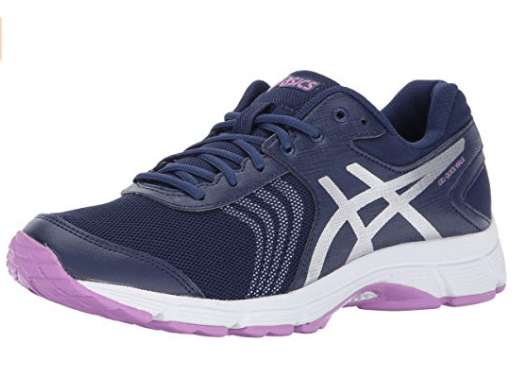 Asics are renowned for their supremely cushioned shoes, and these combine that padding with a nice sturdy sole for protecting your delicate fallen arches. We think they’re ideal for alleviating pain and numbness in feet, as well as joints and back areas. The insole is made from Ortholite material, which is molded to help feet maintain correct arch and heel alignment. It’s also removable and can be exchanged for a gel insert or orthotic. The removable option is a great feature for people with really specific insole needs or podiatrist-designed inserts. They’re true to size! That’s very refreshing in a market full of awkward proprietary size systems. Reviewers also complimented the size of the toe box, which they said was more generous than other walking shoes. If you need extra space for your toes, these are a great choice for you! These shoes use a gel cushioning system to provide support without adding weight. Reviewers said they were extremely light, and felt comfortable from the first wearing. They said that they fit like a sock, which made them much less clunky than buyers expected. The overwhelming consensus from buyers was that these were simply great walking shoes, thanks to the arch support and full-foot cushioning. They’re designed to provide stability while you walk. The motion control helps pronators keep an even keel while walking. That means these are a safe bet for even completely fallen arches. Previous buyers wrote that even if their feet tended to strike unevenly as the heel hit the ground, the structure of the shoe would help the rest of the foot come into alignment on the way through the step. That’s essential for preventing ankle twists and sprains which can be a frequent problem with pronators. We loved ASICS’ old Neo series, but they wore out quickly. The improved outsole material on these makes them last a lot longer than the older walking styles from the same company. These are also a lot less expensive than the older ASICS. Those older walking shoes often cost as much as running models, but these are priced much more reasonably. They’re not for running. These are good casual and walking shoes, you wouldn’t want to use them on the track or trail. There aren’t many color options. 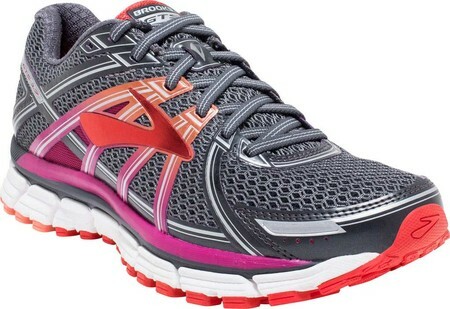 These Brooks are the female-specific version of the Adrenaline model we recommended in the Mens’ section. They’re mostly the same but are anatomically designed to suit women. Previous buyers were pleased by their balance of cushion and support, with integrated motion control. We’d recommend them for people who don’t want such severe arch support, but still, want more structure than your average runner. The sole is shaped so as to provide full-ground contact as you run. This makes for better transitions and smoother motion. It’s also segmented for better flexibility and grip. We really like these caterpillar treads, since they cut down on any wobble while your feet are making contact with the ground. This latest version has superb fore and mid-foot flexion. It’s even better than when Brooks first introduced it on the 16’s. The 17’s also add an asymmetrical midfoot saddle, which provides a more customizable fit than previous generations. We especially love that the whole footbed has been designed specifically for female runners and walkers. As with the men’s version, these Adrenaline’s provide an anatomically correct structure to help you achieve a natural stride. Reviewers loved that this edition added just a slight bit of bounce to the sole, which made the 17’s feel less rigid and more fluid than the 16s. The upper linings are made from lightweight mesh. The material provides odor and heat control and is complemented by vents on the top and sides. The sole is flexible and grooved for added dexterity. The outsole material is reinforced with high-durability material in traditional weak points such as the heel and forefoot. These areas do tend to see more scuffing with flat feet, so the extra coverage is a great feature. The stability footbed is great for pronation control without an intrusive structure. Previous buyers especially liked that the insole was supportive without having a severe arch. This let their feet move naturally but safely. Like with the men’s version, the Adrenaline is the best option for people who don’t want corrective arch support. They run a bit small, which is consistent with previous editions. You may need to order a size up. As we mentioned in our breakdown of the men’s version, the Adrenaline series places more of an emphasis on stability rather than support. If you crave lots of cushioning, you might want to look elsewhere. These are a better choice for folks who want a realistic, tactile road experience with some extra motion control. 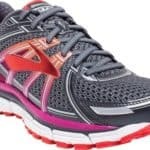 Check current prices for the Brooks Adrenaline GTS 17 Women’s Running Shoes! There’s no one-size-fits-all solution for flat feet, unfortunately. In some cases, people benefit from a corrective approach. They should use shoes with strong arch support to correct for the collapse of their natural arch profile. In other cases, people do better with more minimal shoes that match their lowered arch profile while offering some added support. If you’ve got a totally collapsed arch, chances are you need pronation control. This means you’ll want extra stabilizing features which are found in motion control footwear. Motion control shoes will keep your feet from rolling side to side (pronating). However, if you don’t have much pronation, you might want a less intense running shoe. They’ll be lighter, less restrictive, and feel more like a “normal” running shoe. Plus, even some people with collapsed arches find that severe arch support aggravates their symptoms. Depending on what your podiatrist recommends, you might want a solid arch support, or barely any. It varies widely between people, so that’s a conversation you’ll want to have with an expert before you shop. You’ll also want to have a good handle on your own personal preferences, so you know what’s going to be comfortable for you and give you the road feel you enjoy. Motion control and stability shoes tend to be a bit more expensive than neutral cushioning shoes. They’ll have more sophisticated sole designs, better padding, and a more stable frame built into the shoe. While they shouldn’t break the bank, expect to pay at least $75-$100 dollars for a good pair of stability shoes. Of course, you can always find sales! 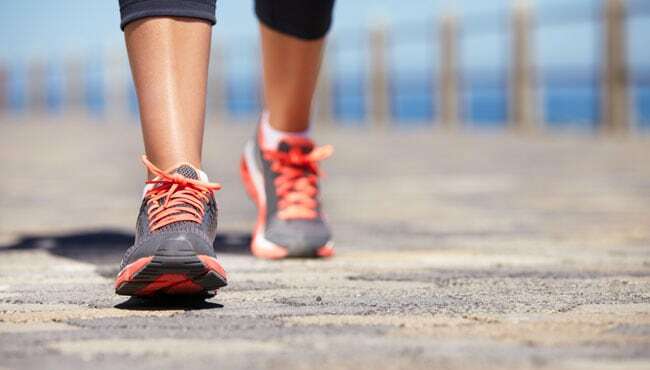 Remember–it’s well worth your money to get a pair of running or walking shoes that will make your pain disappear! Motion control shoes are generally a bit bulkier than neutral cushioning running shoes. Their soles will be thicker and more solid. That means the design won’t be as streamlined overall. Keep in mind that the sleeker the shoe, the less support and cushioning you’ll get. That’s an important consideration, but you won’t have to sacrifice looks entirely, as our choices show! Make sure you start with support and comfort and then think about style. You shouldn’t have to “make things work” in order to look a tiny bit cooler. With that said, just know that you’ll be looking at a substantial midsole. Longevity is another important consideration because since you need constant support and motion control, you need a shoe that will remain sturdy and supportive as long as you need it to. Look for support built right into the sole. 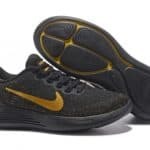 That’s where manufacturers use the thickest rubber materials, so when cushioning is right down in the base of the shoe, it won’t pack down as easily. EVA footbeds also tend to be long-lasting. EVA is a new sort of foam that’s used in hiking shoes, and it’s a lightweight solution for running shoes as well. We suggest looking for EVA or another similar foam in any new pair. Pronators with flat feet also tend to wear out the ends of shoes more quickly–both the toe box and the heel. We’ve looked for shoes with added reinforcements in those key spots. If you’re choosing one of our recommendations, you should be all set in that department. If you’re going to keep shopping on your own, check for those reinforcements before you buy! Now that you’ve looked at our choices of the best shoes for flat feet, which do you go for? It should depend on how severe your pronation is. If you really need stability, try the Asics walking shoes or the Adidas Supernovas. Both have maximum structure and support. The Brooks Adrenaline running shoes are great for giving you normal road sensation while gently correcting and guiding your stride. The Adidas Energy Boost and Nike Lunar Glide provide more cushion, but drop some of the weight. Reviewers loved the gentle, smooth ride, but appreciated that while they’re supportive, they’re not squishy and wobbly. They’re among the best running shoes for flat feet. If you’re interested in more of our recommendations for the best footwear available online, check out our other guides at bestwalkingfeet.com! Happy shopping!